I don't really know why but this diamond fold remains one of my favourite folds for Christmas cards. Perhaps partly because I find it attractive and partly because they're quick and easy - I can cut a 12" square piece of cardstock into three 4" wide pieces to pre-prepare three cards with no wastage. This little mouse is just so cute! 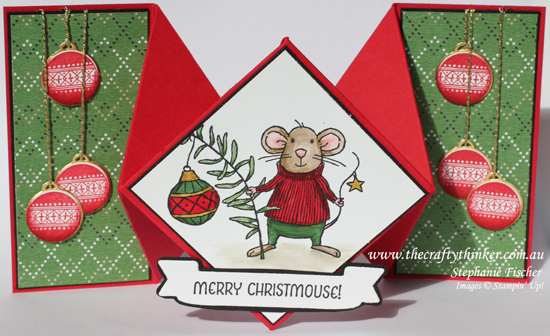 The little mouse on the main panel is from the Merry Mice stamp set. I watercoloured his head and feet but used Stampin' Write Markers to colour everything else. I also added a little Gold Wink of Stella on the bauble and the little star. The side panels are decorated with paper from the Warmth & Cheer Designer Series Paper Stack. I made the little hanging decorations with the Merriest Wishes bundle. I stamped the design with Real Red onto Whisper White cardstock and punched it out with the 1/2" Circle Punch then glued it to the smallest bauble shape cut out of Gold Foil. I added a bit of shading with Cherry Cobbler ink and a sponge dauber. I cut the greeting out with the banner from the Large Numbers Framelits. I adhered that to a piece of Basic Black cardstock and snipped around it. See here for my tutorial to make the Diamond Fold card.